Quality and elegance describes these 14karat earrings. Two centre opals are surrounded by several small opals. All are set in lovely 14karat gold scroll work. The opals are white with colour plays of red, green and blue. These earrings have shepherd hooks and are very secure. 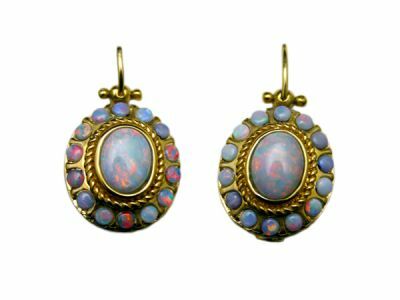 14kt custom made yellow gold earrings with 2 bead-set oval cabochon opals, est 2.72 ct. (9.2x7x2.94mm & 9.3x7.2x3.7mm) (clarity:translucent & colour: reddish orange) and 28 bead-set round cabochon opals, est. 1.03ct (2.3mmx2.3.1.1mm-2.3x2.3x1.3mm) (clarity:translucent & colour: reddish orange).